It’s believed the garden cultivation of roses started around 5,000 years ago and is largely traced to China. But roses have been around for longer than that (35 million years, to be exact), and have popped up as an object of affection throughout history. Red roses appear in poetry, literature, classical artwork, contemporary films, and everywhere in between. Roses are often used in music with other 4,000 songs dedicated to roses. One of William Shakespeare’s most famous lines contains a reference to a rose, spoken by his most romantic heroine, Juliet: “What’s in a name? A rose by any other word would smell as sweet.” Renowned Scottish poet, Robert Burns, compared his love to a red rose in the poem Red, Red Rose, and the card “soldiers” in Alice in Wonderland lost their heads for painting white roses red. Lastly, Victorians needed flowers to express intimacy in a subtle game of courtship, since professing feelings publicly wasn’t socially acceptable at the time. The tradition of giving Valentine’s Day flowers dates back to the late 17th century, during the reign of King Charles II of Sweden. During a trip to Persia, King Charles II was exposed to a new art—the language of flowers. This expressionist art focused on one’s ability to communicate using flowers without uttering any words at all. The fad boomed throughout Europe, with lists of flowers and their meanings widely distributed. 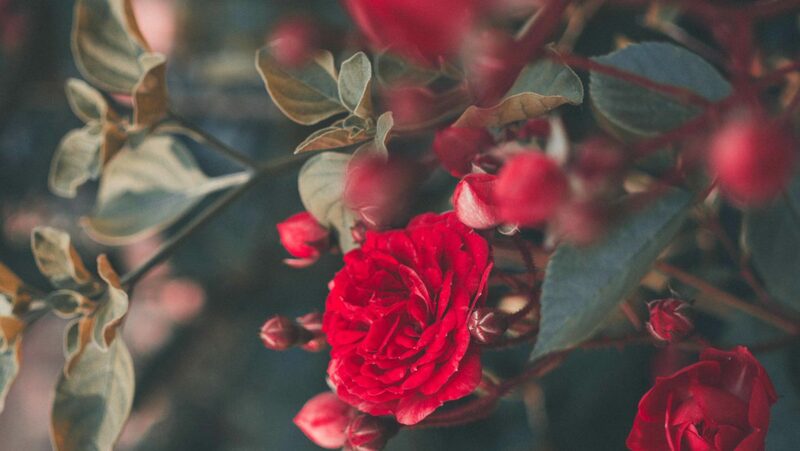 Over time, the red rose took on the meaning of deep love because of its affiliation with Aphrodite, the goddess of love. In Greek mythology, it is said that rose bushes grew from the ground through Aphrodite’s tears and the blood of her lover, Adonis. The Romans, who turned Aphrodite into their goddess Venus, kept the rose as her symbol of love and beauty. The red rose has inspired people for generations. Many feel that this beautiful flower symbolizes passionate love, its delicate petals reflect the caress of a loved one, and its elegance is considered the touch of life itself. So when Valentine’s Day became the mainstream holiday we know today, the rose was an obvious choice for the most fitting gift.